Stock photo of the HMS Tecumseth and HMS Bee (in the background) in Penetanguishene Bay at Discovery Harbour, Midland, Ontario, Canada. At Discovery Harbour, the HMS Tecumseth and the HMS Bee are docked in Penetanguishene Bay. 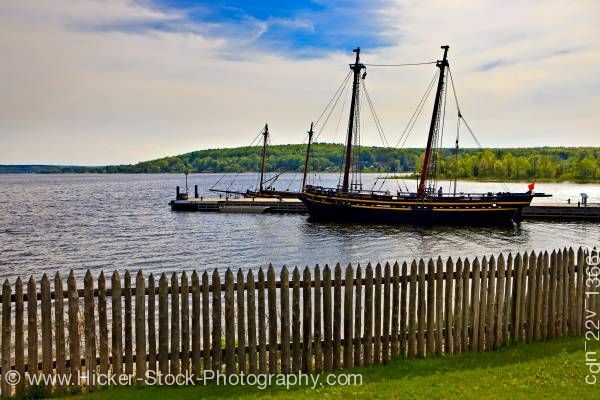 This stock photo shows the replicas of the HMS Tecumseth and HMS Bee (in the background) in Penetanguishene Bay at Discovery Harbour, Midland, Ontario, Canada. A schooner, the HMS Tecumseth and a gun boat, the HMS Bee sit at the dock at the Discovery Harbour in the Penetanguishene Bay. These two vessels are full-scale replicas of the original ships. This view of the vessels shows a wooden picket fence in the foreground. The picket fence runs along the bay in front of a green lawn. A long wharf runs out into the bay where the HMS Tecumseth and the HMS Bee are docked. The trees seem to go on endlessly in the background. The sky you can see a patch of blue surrounded by swirling large wisps of clouds. The HMS Tecumseth and HMS Bee (in the background) in Penetanguishene Bay at Discovery Harbour, Midland, Ontario, Canada.